There’s no shortage of Full HD (1920×1080-pixel) monitors to choose from these days, but if you want to keep costs down you’ll need to choose carefully. This 23in screen is at the smaller end of the desktop PC range, but that’s probably no bad thing. 27in models look somewhat coarse by today’s standards unless they have a higher resolution than this, and while 24in might be considered ideal, you’ll pay a bit more for it. For a relatively cheap display, the VC239H’s black plastic case looks pretty good, with narrow bezels ­ less than a centimeter at the top and sides ­ and none of the ugly details that often betrays a low-end model. On the back, a pair of 1.5W stereo speakers are directed downwards so that they still work if you use the VESA mounting point to fix the screen to a wall rather than the supplied circular base. The base offers only a bare minimum of tilt adjustment, and the power supply comes as a separate mains adapter brick rather than being built in. The screen is a decent IPS panel. As you’d expect from this technology, it’s visible from a wide range of angles and gives accurate enough color for photo editing in the VC239H’s sRGB mode, even if contrast is slightly lacking. Switch to Standard mode and it artificially boosts the colors. This is good for games, TV shows and films, and manages to increase contrast substantially while showing clear detail in the darkest areas. Asus touts the screen’s ability to filter out blue light, reckoned to make it more comfortable to use for extended periods and less disruptive to your sleep if you’re still using it just before heading off to bed. Other software features include a centre crosshair for gamers and a `QuickFit’ option that shows actual-size templates for common document and photo formats so you can see how images will look when printed. Aside from those speakers, however, you don’t get any hardware extras; there’s no USB hub, for example, to put extra connections into your PC. If you want more advanced functionality in a monitor, you’ll have to look elsewhere, but if your priority is solid image quality, the VC239H is excellent value for money. 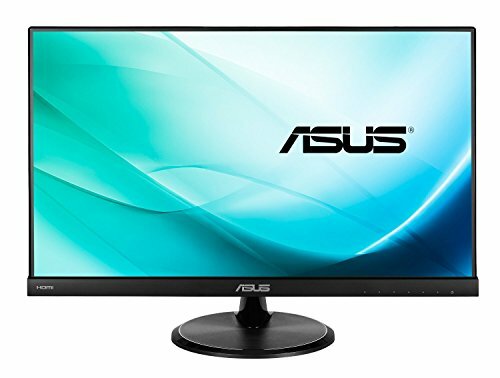 It's short on frills, but this medium-sized monitor has the essential qualities to make a worthy companion for any PC.